In the US, growing okra is most popular in the southern states and in other places with good, long, hot summers. Okra is an unusual plant, in that there aren’t really any other garden vegetables that are related to it. It is in the mallow family, which means it’s related to hollyhocks, hibiscus, and ornamental rose-of-sharon (you can see the family resemblance in the flowers). Okra is also related to the common weed mallow, which is an edible wild green, but mallow qualifies more as survival food than a truly a delectable vegetable. And if you’ve ever travelled through Asia, you may remember the odd-tasting (dare I say... stinky?) but popular dorian fruit, which is also a relative. Depending on the variety and your climate, okra can get to be 4 to 7 feet tall, so give it plenty of space! The larger varieties can also tend to get top-heavy, so be prepared to stake the plants if necessary. Dwarf varieties of okra make good container plants, too, but if you are growing okra in containers, use large pots with rocks in the bottom so that the whole thing doesn’t tip over. I have some big, homemade tomato cages that are about 2 feet in diameter, and I plant 3 okra plants evenly spaced around the outsides of these cages. This puts them at about 20” centers. I wait until about 3 weeks after the last average frost date when the soil has warmed up and then direct seed them in the ground. The seeds look like little green BBs, and are easy to handle. Plant them about 3/4" deep. I put two seeds in each hole, and then I pinch off the smaller seedling when it is about 2" tall (if both sprout). They don’t really need the cages, but the cages give me something to tie the plants to if they start getting top-heavy and leaning over into other veggies’ space. I have my okra (as well as the sunflowers) along the north side of my garden so they don’t shade out my other veggies. 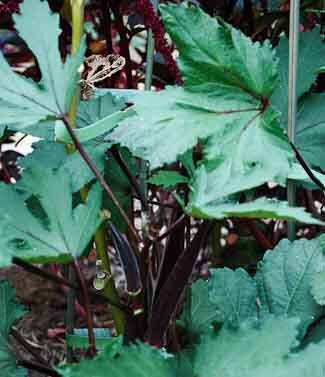 Okra is a pretty tough and carefree plant, not subject to many pests or diseases. 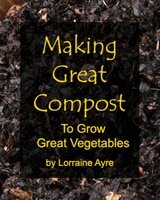 It doesn’t usually need fertilizer, but it does appreciate lots of good compost worked into the soil prior to planting. It likes to have regular watering, but most of all, it likes it hot hot HOT – 80, 90, even 100 degrees in the day. Growing okra successfully also means giving it enough water. It can handle short dry spells, but if you want it to produce as many pods as possible make sure it gets enough water. And it doesn’t just need hot days, it also needs warm nights, 60 degrees F. or better, so it really is a mid-summer plant in most areas of the US. Okra pods get really woody and tough when they mature, and they become inedible. So make sure you harvest them before they become mature - when they are only about 3 or 4 inches long (for most varieties). There are varieties that are bred to be bigger than this before they get woody, so read your seed packet for the recommended harvest size for your variety. A growing okra pod can double in size overnight, so just like your cucumbers and zucchini, check on them every day. I never wear gardening gloves as a rule, because I like to be able to feel the soil, my plants, and my tools (and I actually like to build calluses), but when I’m harvesting okra (or pulling thistles), I make an exception. Though there are now spineless varieties available, okra is usually a spiny, bristly plant that can cause ouches and scratches, so wear gloves when you harvest. Scrub the pods with a green scrubby like a Scotch Brite when you get them into the kitchen.